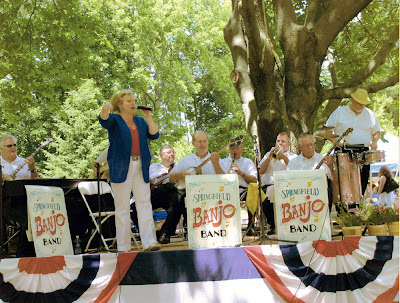 Springfield Banjos N Brass will play the historic Clifton Opera House on Friday, August 19th at 7:30 p.m. This interesting group mixes a blend of traditional jazz forms to provide a wide variety of sounds of the ragtime and early jazz eras. They add several different modes of playing, with they’re various instruments, such as brass, woodwinds, percussion, bass, banjos, vocals, guitars, and Honky Tonk piano. The selection of “Tin Pan Alley” tunes were the Hit Parade numbers of that era, and the lycerists and composers were the elite of that era, making them classic numbers transcending the decades of popular music. Doc Cain and his group are an Opera House favorite. The music is toe-tapping to say the least, and the zest the performers exhibit during the performance makes the show “contagious” to the audience. They have been performing for nearly forty years around western Ohio region and have performed for high level dignitaries. The Clifton Opera House is owned and operated by the Village of Clifton as a fund raiser for the historic building maintenance fund. Call 937.767.2343 for information. Box office opens at 6:30 p.m.